Stay True Plumbing officially started March 1, 2014, founded by Kenneth Zajackowski, after over 8 years of service in the plumbing field. Ken knew he wanted to change the way plumbing service was done after witnessing countless customers taken advantage of by many plumbing service contractors. He wanted to put the “customer first priority” back into a trade that seemed to forget the number one rule of customer service. Ken had an already growing reputation at a previous employer where many customers would ask for his services by name. He would become the top service plumber as well as running all of the excavation jobs for the company. After completing Plumbing Trade School, the required hours as a Journeyman Plumber, and passing the Master Plumber exam he knew exactly what he wanted to do; start his own plumbing company with the hope that his strong reputation and work ethic would drive him to success. Stay True Plumbing LLC, was created; the name came from a saying that Ken came up with in 2010 while facing the stresses of life and trying to figure out his future. “Stay Focused… Stay True” – stay focused on all of our goals and dreams; while staying true to yourself and those around you. So when it came time to come up with a company name, it was only right to use Stay True Plumbing LLC. 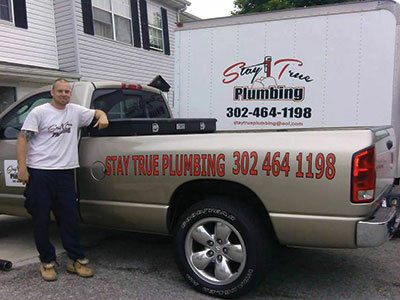 The Stay True Plumbing LLC name speaks for itself, and the reputation behind the name is growing every day. We put the “customer” back into “customer service plumbing.” Our whole goal is to make the process of a plumbing problem as stress-free, and pleasant as possible. We handle both big and small plumbing problems; from the dripping faucet, the clogged drain line, to the extreme of excavating your yard for a sewer or water service repair. Give you the best service we can at the best price we can. Never try to sell you anything that you don’t need. Give you helpful tips to decrease your plumbing problems. Our goal is and always will be to Stay True to our customers, our work, and our word. Thanks for reading our biography, and we hope you give us a call the next time you need a plumber.